Omega-3 fatty acids are considered essential fatty acids: They are necessary for human health but the body can’t make them — you have to get them through food. Omega-3 fatty acids can be found in fish, such as salmon, tuna, and halibut, other seafood including algae and krill, some plants, and nut oils. Also known as polyunsaturated fatty acids (PUFAs), omega-3 fatty acids play a crucial role in brain function, as well as normal growth and development. They have also become popular because they may reduce the risk of heart disease. The American Heart Association recommends eating fish (particularly fatty fish such as mackerel, lake trout, herring, sardines, albacore tuna, and salmon) at least 2 times a week. Research shows that omega-3 fatty acids reduce inflammation and may help lower risk of chronic diseases such as heart disease, cancer, and arthritis. Omega-3 fatty acids are highly concentrated in the brain and appear to be important for cognitive (brain memory and performance) and behavioural function. In fact, infants who do not get enough omega-3 fatty acids from their mothers during pregnancy are at risk for developing vision and nerve problems. 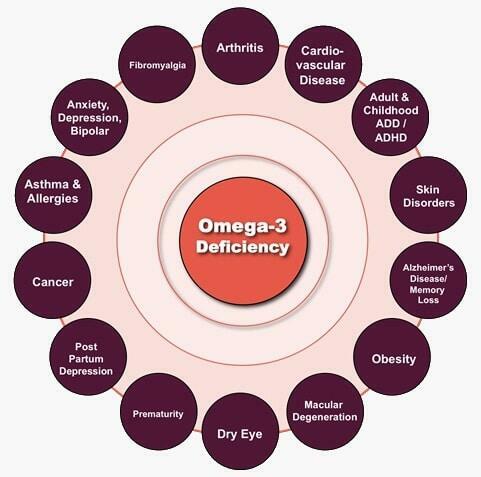 Symptoms of omega-3 fatty acid deficiency include fatigue, poor memory, dry skin, heart problems, mood swings or depression, and poor circulation. People with diabetes often have high triglyceride and low HDL levels. Omega-3 fatty acids from fish oil can help lower triglycerides and apoproteins (markers of diabetes), and raise HDL, so eating foods or taking fish oil supplements may help people with diabetes. Another type of omega-3 fatty acid, ALA (from flaxseed, for example) may not have the same benefit as fish oil. 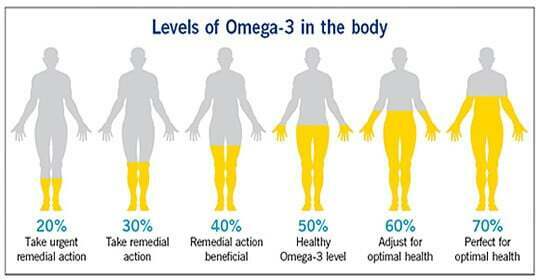 Some people with diabetes can’t efficiently convert ANA to a form of omega-3 fatty acids that the body can use. Also, some people with type 2 diabetes may have slight increases in fasting blood sugar when taking fish oil, so talk to your doctor to see if fish oil is right for you. Some studies suggest that omega-3 fatty acids may help increase levels of calcium in the body and improve bone strength, although not all results were positive. Some studies also suggest that people who don’t get enough of some essential fatty acids (particularly EPA and gamma-linolenic acid [GLA], an omega-6 fatty acid) are more likely to have bone loss than those with normal levels of these fatty acids. In a study of women over 65 with osteoporosis, those who took EPA and GLA supplements had less bone loss over 3 years than those who took placebo. Many of these women also experienced an increase in bone density. Studies have found mixed results as to whether taking omega-3 fatty acids can help depression symptoms. Several studies have found that people who took omega-3 fatty acids in addition to prescription antidepressants had a greater improvement in symptoms than those who took antidepressants alone. Other studies show that omega-3 fatty acid intake helps protect against postpartom depression, among other benefits. However, other studies have found no benefit. In a clinical study of 30 people with bipolar disorder, those who took fish oil in addition to standard prescription treatments for bipolar disorder for 4 months experienced fewer mood swings and relapse than those who received placebo. But another 4 month long clinical study treating people with bipolar depression and rapid cycling bipolar disorder did not find that EPA helped reduce symptoms. Studies examining omega-3 fatty acids for asthma are mixed. In one small, well designed clinical study of 29 children with asthma, those who took fish oil supplements rich in EPA and DHA for 10 months reduced their symptoms compared to children who took placebo. However, most studies have shown no effect.